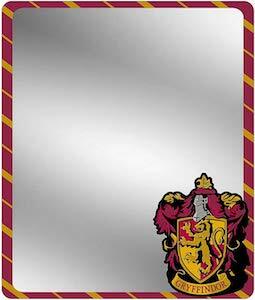 If you are a Harry Potter fan with a locker then you should check out this Gryffindor locker mirror. So now you can see yourself in your locker all thanks to this mirror. The Harry Potter locker mirror is 6.5 x 5.5 inch and are made from vinyl with a magnetic back so that it can’t break like glass and can be easily removed from any metal surface. On the front the mirror has a giant area that reflects and the border is red and yellow just like the Gryffindor and then in the right bottom corner you can find the big crest of the Gryffindor house. This does make for a fun present for a Harry Potter fan with a locker at work or school.